Part memoir, part oral history, #1 New York Times bestselling author Sherryl Woods gives us a rare and intimate look at Colonial Beach, Virginia. 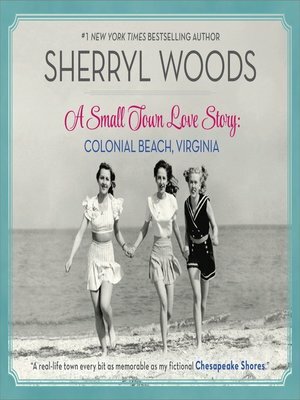 Rich in narrative history and local color, A Small Town Love Story: Colonial Beach, Virginia is an homage to the town of Sherryl Woods's summers, a place that stole her heart long ago and provided the basis for the many fictional small towns in her bestselling novels. True to Woods's signature style of focusing on characters who are at the center of their communities, here she has woven together the stories of the very real people who helped shape this seaside Virginia town. She takes us back to the days of her own family gatherings, artfully capturing the unique essence of Colonial Beach and making us yearn for small-town life. Woods's own memories frame the true stories she features—from the unique history of Colonial Beach itself to some firsthand accounts of the Oyster Wars that once consumed the community, to the stories of neighborhood merchants who made it a point to know just about every customer by name. From farmers to restauranteurs and hoteliers, from pastors to librarians and military folk, Woods's research and interviews give life to the personalities of a very special place.